On Wednesday 23rd June 2010, with the government in turmoil, Julia Gillard asked then Prime Minister Kevin Rudd for a leadership ballot. The next day, Julia Gillard became Australia's 27th Prime Minister, and our first female leader. Australia was alive to the historic possibilities. Here was a new approach for a new time. 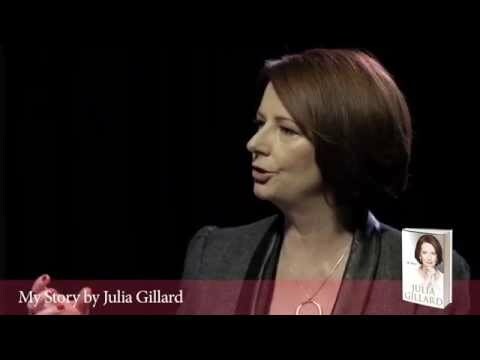 This is Julia Gillard's chronicle of that turbulent time - a strikingly candid self-portrait of a political leader seeking to realise her ideals. It is her story of what it was like - in the face of government in-fighting and often hostile media - to manage a hung parliament, build a diverse and robust economy, create an equitable and world-class education system, ensure a dignified future for Australians with disabilities, all while attending to our international obligations and building strategic alliances for our future. This is a politician driven by a sense of purpose - from campus days with the Australian Union of Students, to a career in the law, to her often gritty, occasionally glittering rise up the ranks of the Australian Labor Party. Refreshingly honest, peppered with a wry humour and personal insights, Julia Gillard does not shy away from her mistakes, admitting freely to errors, misjudgements, and policy failures as well as detailing her political successes. Here is an account of what was hidden behind the resilience and dignified courage Gillard showed as prime minister - her view of the vicious hate campaigns directed against her, and a reflection on what it means - and what it takes - to be a woman leader in contemporary politics. Here, in her own words, Julia Gillard reveals what life was really like as Australia's first female prime minister. Let’s face it, most political memoirs are a self-serving bore. But I found Julia Gillard’s My Story far more rewarding and less revisionist than many. The backroom stuff about Rudd (and Carr) is especially juicy, but she’s also strong on the legislation and reform she steered through the ugliest parliament of recent memory. What’s never in doubt is her steeliness, her resolve and her vision. I disagree with her on communication and, in some instances, policy, but admire her calm sense of purpose. Julia Gillard was sworn in as the 27th Prime Minister of Australia on 24 June 2010 and served in that office until June 2013. Previously, following the Australian Labor Party's victory at the 2007 Federal Election, Ms Gillard served as Deputy Prime Minister and Minister for Education, Employment and Workplace Relations and Social Inclusion. Ms Gillard was born in Barry, Wales in 1961. She is the daughter of a nurse and aged care worker. Her family migrated to Australia in 1966 and she grew up in Adelaide. Ms Gillard developed Australia's guiding policy paper, Australia in the Asian Century. Ms Gillard delivered nation-changing policies including reforming Australia education at every level from early childhood to university education, creating an emissions trading scheme, improving the provision and sustainability of health care, aged care and dental care, commencing the nation's first ever national scheme to care for people with disabilities and restructuring the telecommunications sector as well as building a national broadband network. In foreign policy, Ms Gillard strengthened Australia's alliance with the United States, secured stronger architecture for the relationship with China, upgraded Australia's ties with India, and deepened ties with Japan, Indonesia and South Korea. Ms Gillard has represented Australia at the G20, including winning Australia's right to host the 2014 meeting, the East Asia Summit, APEC, NATO-ISAF and chaired CHOGM. Under Ms Gillard's leadership, Australia was elected to the United Nations Security Council. In October 2012, Ms Gillard received worldwide attention for her speech in Parliament on the treatment of women in professional and public life. After departing politics, Ms Gillard has accepted roles as honorary Professor of Politics at University of Adelaide and Nonresident Senior Fellow, Global Economy and Development at Brookings Institution. In March 2014 Ms Gillard was appointed as chair of a global education program that aims to get the world's poorest children into school. The Global Partnership for Education is an international initiative made up of nearly 60 developing countries, donor governments, international organisations, the private sector and civil society groups. I found this book fascinating; very informative about day to day workings of cabinet. While it is written from Julia Gillard's perspectiveand one will be drawn (or not) depending on one's political leanings, I felt it was an honest attempt by our first female Prime Minister to give a detailed account of her time in office. Julia - the other woman! It's good to get Julia's story from her personal viewpoint. So much rubbish has been levelled at her and about her that to read the other side of the story is both enilghtening and evens the score somewhat, although not enough in my opinion. I was looking forward to this book. Found the structure of it terribly confusing. Would have been much better if it had been consecutive information. I ended up dipping into it in a random fashion and therefore have probably missed scads of information. The writing is frank and some self knowledge is demonstrated compared to most politicians. I admire Ms Gillard's achievements and fortitude immensely but the writing in this autobiography is undistinguished and the tone flat and somewhat plodding. Not a page turner. I really want to like this book, but I can't help noticing it is more like political lobbying/electioneering than simply a decent read from a lady with articulate poise and dignity. I will never forget the misogyny speech. Nor the gracious exit speech post leadership spill. That is how I best appreciate Ms Gillard. This book does not cut it. Yes, it's sad, and a little disgusting in its revelations about the most undeserved treatment of someone. Yes, it's a terrible indictment on politics and politicians. Yes, it reinforces all many of us suspected about the Kevin rumours. Still, I just don't feel that this is the "real" Julia speaking. And that is a major let down for me.